Disclosure: This post is sponsored by Allstate Canada. All opinions are my own. Allstate Canada has released their 10th Annual Safe Driving Study and is taking action to make communities safer. Over the last 10 years, Allstate Canada has been committed to safe driving and is studying how safe our roads are. Each year, they report on which provinces and cities have had poor results, and where improvements have been made that year. Allstate Canada wants to hear from you! Do you have a suggestion to help make our neighbourhood roads better? Submit your safety improvement ideas for your community and have a chance to win 1 of 4 $1,000 gas cards. Allstate Canada will choose up to three ideas to be implemented. Enter the “Allstate Takes Action” contest now! In 2017, Oakville ranked 53rd of the 93 cities studied for the report. Even though we improved from the 2016 ranking, there is a lot we need to do to make our town’s roads safer. School zones have long been a concern. 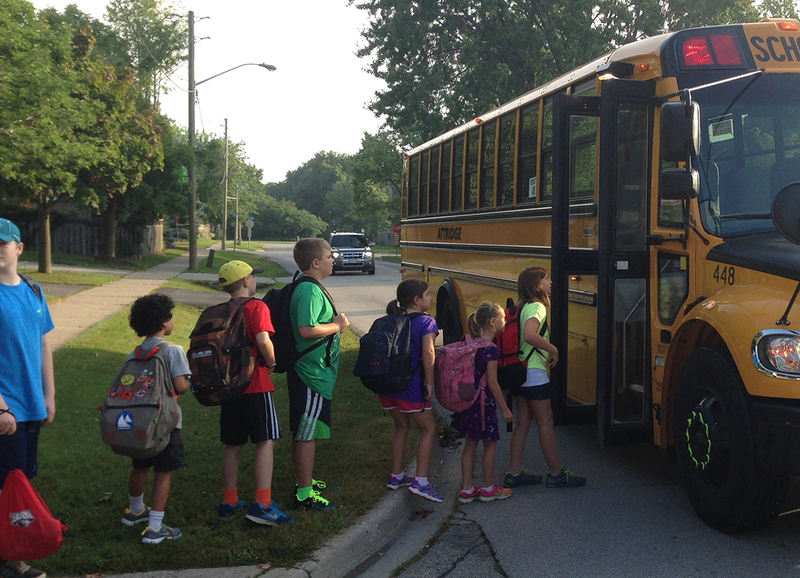 Anything from drivers travelling too fast, to disobeying the flashing red lights on school buses, to frantic parents wanting to drop off or pick up as fast as possible and putting others in danger. Although they cannot control the on school property traffic violations, speed humps will generally slow traffic down considerably in front of schools. I am a huge supporter of controlling speeds around schools. Adding more of these speed humps in front of schools across Canada will ensure that drivers keep their speed in check when travelling in school zones. Vehicle Activated Traffic Calming Signs have begun popping up all over our town, and I am loving them. They are an instant notification to drivers of exactly how fast they are going, and in case of high speed, a bright white light flashes telling them to slow down. The bright light almost looks like the bright lights on an emergency vehicle. I’ve always been the type to know when an idea is a good one, to run with it. We can come up with all kinds of ideas, but improving on an existing one can be just as good, if not better. It has been my observation that vehicle activated traffic calming signs are installed in areas of concern, and then rotated to other areas after a few months. While this helps during that time, once the signs are removed and moved elsewhere, the constant reminder is no longer there. In today’s age of distracted driving, having that reminder is so important. I would love to see communities across Canada install these signs in all school zones and other areas of concerns… permanently. I know, they cost money. But somehow, so many other initiatives get approved that just don’t seem as important as the safety of our drivers on the roads in our communities. We need these reminders. • Ontario is home to both the community with the lowest 10-year average collision frequency rate, as well as the one with the highest. • Hanmer had the lowest 10-year average collision frequency rate at 3.1% (#1 / 64). • North York had the highest 10-year average collision frequency rate at 7.1% (#64 / 64). Don’t forget to submit your safety improvement ideas for your community and have a chance to win 1 of 4 $1,000 gas cards. Enter the “Allstate Takes Action” contest now! And be sure to check out Allstate Canada’s 10th Annual Safe Driving Study.